You may be stuck in the coldest, snowiest part of winter, but the good news is that spring break is headed your way. Even better news? Airfare for spring break 2016 is actually trending lower than in years past. According to our data, overall flight prices are down almost 13% compared to the same time period in 2015. But don't let the savings stop there. Below are six tips from the Hopper team to help you save a few extra bucks on your spring-break flight. Treat Yourself to a Nonstop - Destinations with nonstops are often more competitively priced than more far-flung destinations without direct flights, and those nonstop options can be up to 10% cheaper than less popular flights with stops. Fly Midweek - We know it's not always convenient to jet out on a weekday rather than the weekend, but you could save as much as 25%. We found that generally, Tuesday is the cheapest day to depart this spring, while Monday to Wednesday departures are up to 25% cheaper than Thursday to Saturday. And forget Friday: For most popular spring-break routes, Friday departures are the most expensive. Be Flexible on Dates - If you can be flexible, you should take your break in early March or late April. Avoiding peak school-vacation weeks between those dates could be the key to pretty sizable vacation savings. The most expensive times to travel from a U.S. airport this spring are the weeks of February 9 (30% premium), March 23 (32% premium), March 30 (a painful 45% premium) and April 6 (28% premium). Begin Monitoring Prices Now - Finally, spring break is a major peak season for travel, when booking last-minute flights will hit your wallet the hardest. Pick a destination and have Hopper monitor prices for you as early as possible. We scoped out some destinations below that we are forecasting will drop in price this spring if you need ideas. Know that, in general, booking less than less than two weeks in advance adds 33% to your ticket price. And booking within three days of departure? That'll cost you a whopping 66% more. The Hopper app predicts future flight prices with 95% accuracy. If you select the "Watch This Trip" button, Hopper will constantly monitor prices and notify you the instant you should buy. 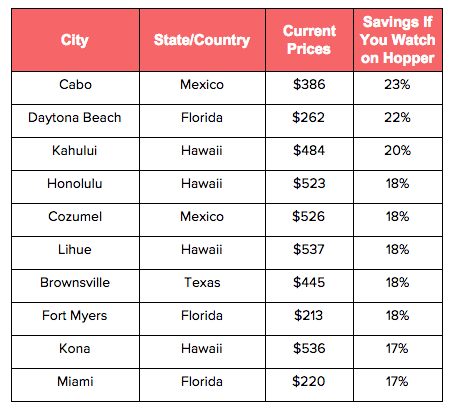 We calculated popular spring break destinations where you could save most by watching prices with Hopper. 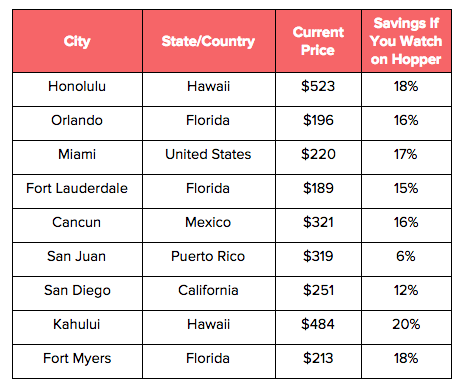 If you're interested in visiting any of these destinations for spring break, we recommend setting your watch on Hopper now so that you can be alerted about price drops this month. If you're interested in spending your break at one of the most popular destinations, the list below are the most watched destinations on Hopper for dates this spring. If you want to avoid crowds, you may want to seek destinations that aren't featured on this list. The data presented in this analysis comes from Hopper's combined feed of Global Distribution System (GDS) data sources which includes about ten million queries and one billion trips per day. Demand is represented as the number of queries not actual ticket purchases, and is calibrated across all GDS sources for each market.